Navajo Nation Considers Hunting Wild Horses | "OUR WORLD"
Wild horse on Navajo Nation land. Window Rock, Arizona – In an effort to reduce the number of wild horses in the Navajo Nation, the Navajo Nation Department of Fish and Wildlife is in the early stages of planning a wild horse hunting program. The program would allow people to purchase hunting permits to shoot wild horses. 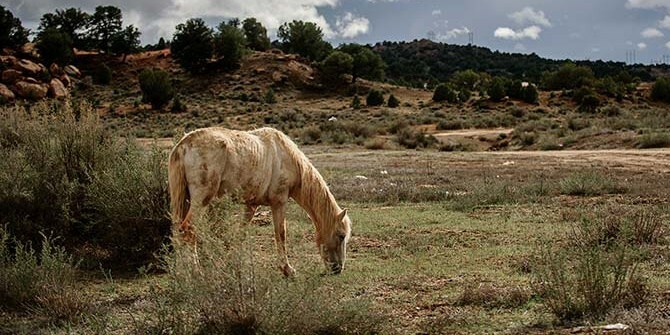 “Historically, Indian reservations have valued their wild horses very much,” Simone Netherlands, president of the Salt River Wild Horse Management Group, told reporters. She suggests using dart guns with birth control to reduce the reproduction rate of horses. “You can bring a population to a zero-percent growth rate or even a minus-percent growth rate if there is a certain number that you want that population to get to,” she said. Wild horses on tribal land are not protected by the Wild Horse and Burro Act, and are the property of the reservation. Many tribes round up the horses on their land and ship them straight to slaughter as a source of income.